A lazy Sunday afternoon. Kiddo, hubby and I were lying down together on the floor, relaxing and just spending some good time together. I nested my head on hubby’s chest, closed my eyes, thinking happily about the little pleasures of life. “Errr……No”: I answered, wondering where this conversation was leading to! Me. red faced and totally embarrassed at being compared to an elephant, got up and left. It’s the kiddo’s laughter that still haunts me!! This recipe is off to the 30 day long April Marathon, hosted by Valli. This recipe is same as the one for Stained Glass Cookies, with a different shape and minus the candy! If you find that the dough is too soft for rolling, shape it into a disc and refrigerate for 20-30 minutes till its firm. Divide the dough into four equal portions. Add cocoa powder to two portions. Knead till you get a uniform brown colour dough. In a slightly floured surface or between two parchment papers. Roll one portion of vanilla dough (plain dough) and cocoa dough into 1/4″ thick. 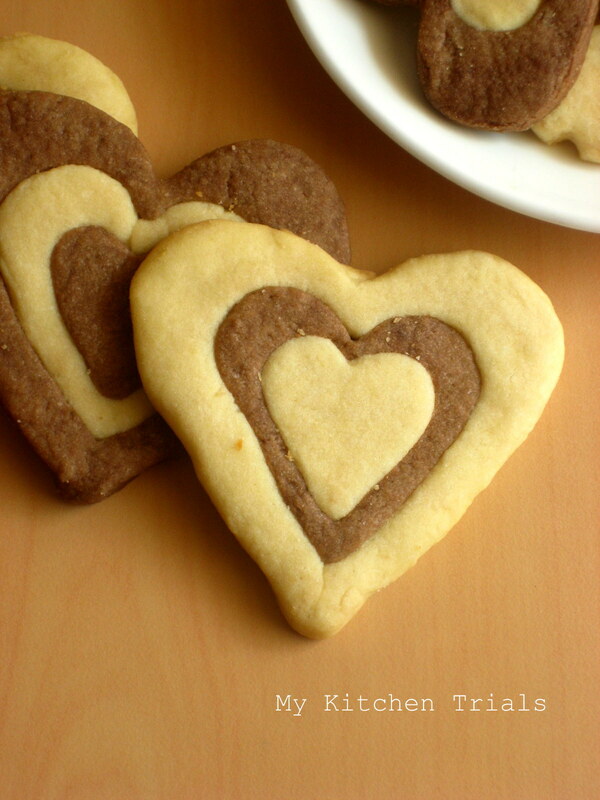 Using the biggest cutter of a nested heart cookie cutter set, cut out cookies from both the dough. Cut out smaller cookies from this big cookie and interchange to get alternate colours. Rajani..I am rolling with laughter after reading your post!..well surely the scene is opposite here ..where I would say such a dialogue! 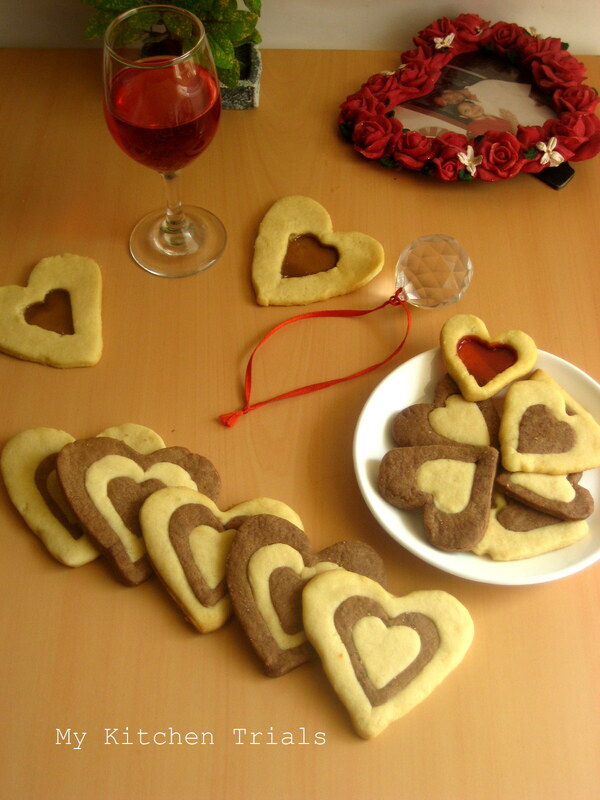 !..ha ha..love the cookies..and no I wont bake these..I will get a parcel from a loving friend:))..what say? 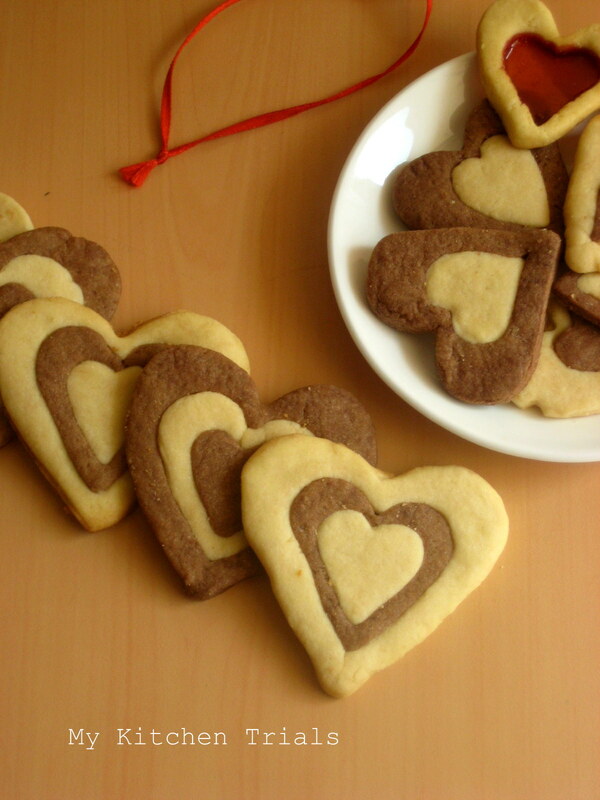 Lolz Rajani, cant stop laughing here.. Those cute heart shaped cookies are absolutely stunning. Lovely Post it’s make my heart to float…. ROFL…Rajani, that was hilarious!..and that picture decorated with heart looks so cute as well..:))..
haha! Super funny write-up and yummmm I do remember these cookies!!! That was a very hilarious narration! !And the cookies look very cute! Rajani LOL. I am just giggling and the girls have waled out on me. Love the cookies. I still have the carton that yo gave them in. They are ind of empty. How about you filling them up again. The cookies look so cute and love the color combo..
Rajani that was hilarious though I know that you are no where close to being obese. These cookies are on my list ever since I saw you post the stained glass version. Lol. Your hubby’s VERY funny. Cookies are soooo cute. Bookmarked!! Hahahaha Rajani, dont you worry my husband calls me a paper weight :P And the sheen on the cookies is marvelous. Love them. 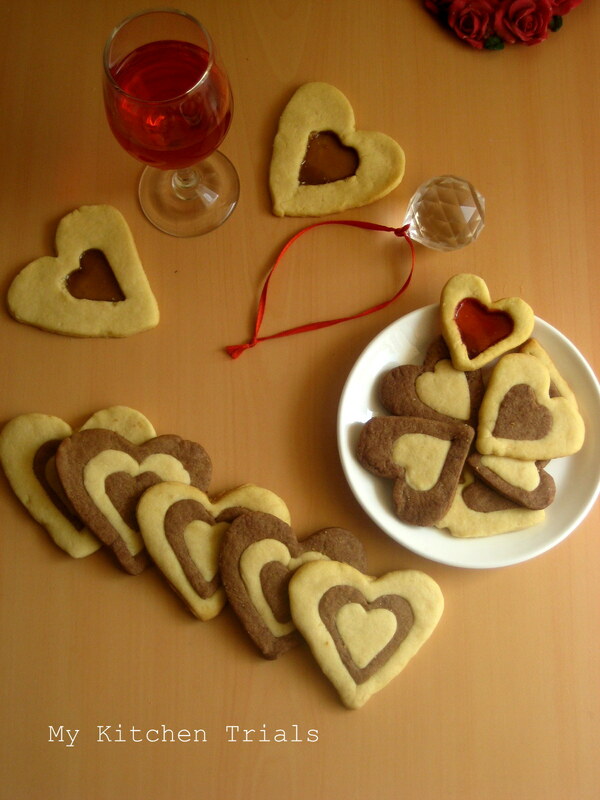 Love those cookie, perfect one for valentine party. superbly written post.. I totally love ur humour !! and the cookies look delish !